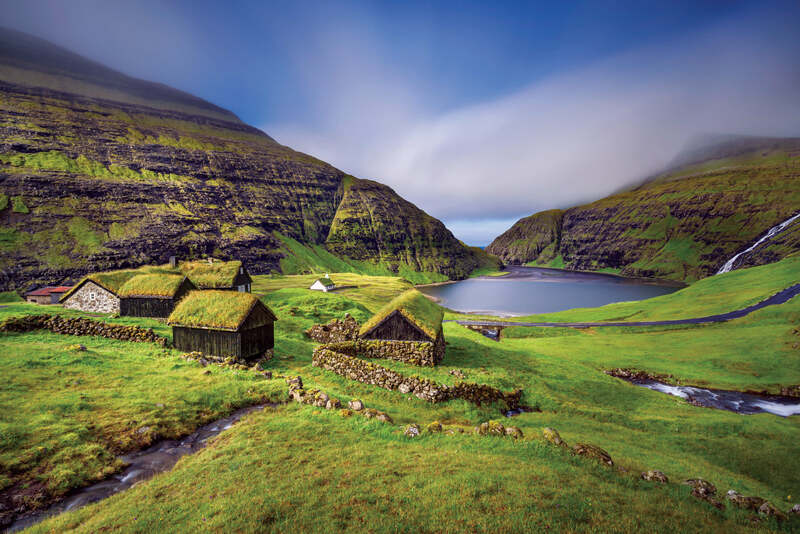 Faroe Islands - NEW FOR 2019 | Fully customized itineraries to Europe, Central and South America. Your tour, your way. 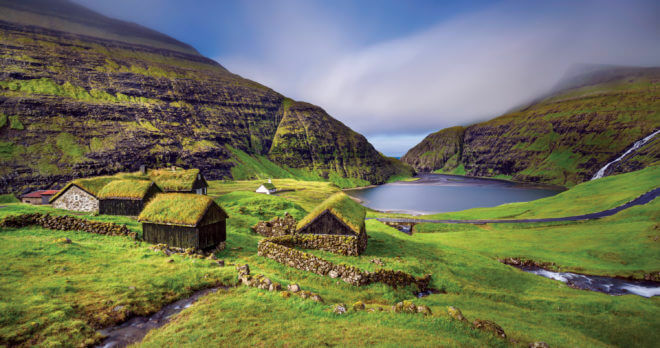 Located in the North Atlantic Ocean, the Faroe Islands are a unique destination defined by unspoiled nature and incredible landscapes. This 9-day itinerary is designed for the first-time visitor, allowing for easy exploration at your own pace with a rental vehicle. Ever-changing weather conditions make for breathtaking scenery and discovery of wildlife including puffins and other sea birds. Price as indicated valid April 1, 2019, based on two passengers travelling together. Subject to availability at time of booking. For alternative dates, inquire for pricing. Itineraries are fully customizable. Not valid during trade shows, bank holidays and other special events. Blackout periods may apply. Please note that weather may affect itineraries. Some tour schedules vary based on seasonality. *Renters liability DKK 1000 due locally. Car rental does not include fuel, parking tickets or PAI. **European city/tourist taxes collected locally unless otherwise indicated. COPENHAGEN – VÁGAR Fly from Copenhagen to Vágar, one of the 18 volcanic islands in the archipelago of the Faroe Islands, part of the Kingdom of Denmark. Welcome by our local representatives who will assist you with your rental car. We recommend you take a drive to the small picturesque villages of Bøur and Gásadalur which were once only accessible by foot; take in an unparalleled view of the fjord, the islet of Tindhólmur and Mykines. VAGAR – VESTMANNA – KVIVIK – EIDI – GJOGV Breakfast. Pass through the first sub-sea tunnel, which sits 105m below sea-level at its deepest. 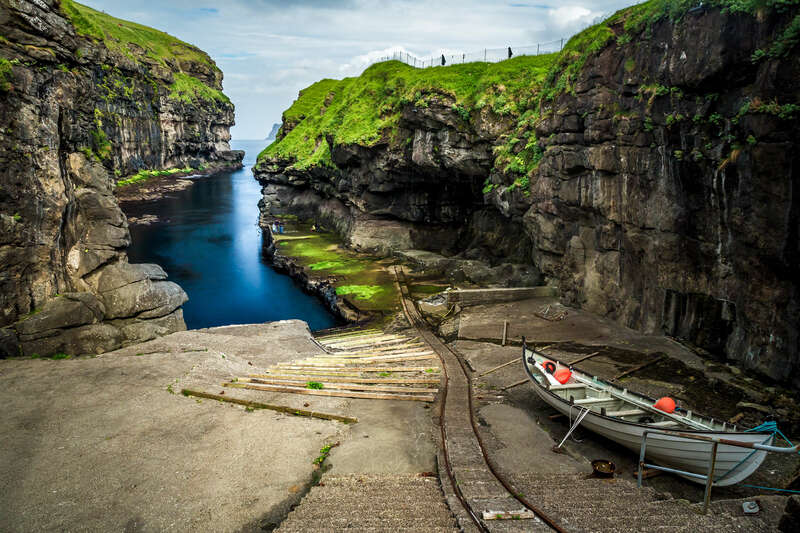 Continue to Vestmanna, where you will take a 2-hour boat tour and experience the most popular attraction on the Faroe Islands, the Vestmanna Bird Cliffs. These cliffs and caves provide safe nesting places during the summer months for thousands of sea birds such as puffins, razorbills, guillemots and fulmars. Continue on to Kvívík to see the Viking settlements; then travel to Eiði. See the famous rock formation known as the ‘giant old hag’ and Slættaratindur, the highest mountain on the Faroe Islands. Arrive at the small and charming village of Gjógv. TJØRNUVÍK, SAKSUN Breakfast. Visit Tjørnuvík to see tracks and remains of the Vikings; enjoy a walk and the amazing views along the beach. Stop at Saksun, a village surrounded by steep mountains and a lagoon-like lake with a sandy beach leading out to the Atlantic Ocean. During low tide, it is possible to walk along the sandy shore of the lagoon around the headland. Back in the village, visit the church and the old farmhouse Dúvugarðar. Return to Gjógv for overnight. GJÓGV – OYNDARFJØRÐUR – BORÐOY Breakfast. Check out and travel towards Klaksvík, passing Oyndarfjørður along the way. Take time to see the Rolling Stones, two boulders, one of which still moves. This is an unusually beautiful place to dive and swim around both stones. Pass through another sub-sea tunnel to Borðoy Island; at the deepest point, you will see Tróndur Patursson’s fantastic light installations. Check into your hotel in Klaksvík. NORTHERN ISLANDS & SEAL WOMAN Breakfast. Travel to Viðareiði to enjoy beautiful views of Fugloy, Svínoy, Borðoy and Kunoy. For those who are fit, active and accompanied by a guide, you can climb the mountain north of the village to the top of the world’s highest promontory, Cape Enniberg. Visit Kalsoy, known for its many legends; the best known is about the Seal Woman, Kópakonan, who was captured and forced to marry a farmer’s son from Mikladalur and had children with him. She longed to go back to the sea; see her beautiful statue in the village of Mikladalur. LEIRVÍK – VÁGSBOTN – TÓRSHAVN Breakfast at your hotel and check out. 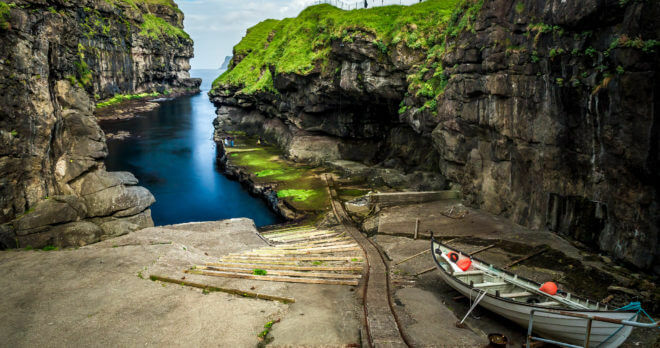 Stop in Leirvík, a fishing village, to see archaeological excavations of 9th-century Viking settlements. In Tórshavn, take the opportunity to visit the Faroese handy work and design shops, the cozy cafés near the harbour Vágsbotn, and maybe even stop for a visit at the National museum, the Art museum and the Nordic house. NÓLSOY, BORÐAN Breakfast. Just 20 minutes away, visit the island of Nólsoy, which we suggest you tour with a local guide. If you are feeling active, take a relatively long hike out to Borðan to find the lighthouse at the southern tip of the island. The island is home to the largest colony of storm petrels, birds that can only be seen at night. TÓRSHAVN Breakfast. Explore the town of Tórshavn, the smallest and most cozy capital in the world. Reyni is the well-preserved old and historic part of Tórshavn; the iconic red buildings on Tinganes are home to the Government of the Faroe Islands. Tour Kirkjubøur, the old cultural center of the Faroe Islands. We recommend dining at Koks, a Michelin star restaurant focusing on innovative traditional Faroese food with local produce. VÁGAR – COPENHAGEN – HOME After breakfast, return your car and fly back to Copenhagen to begin your journey home.